Networking is an important aspect of getting your brand out there. Spending time talking to people about your business can bring in dozens of referrals and future clients. Boost your personal brand with professional business cards to make a lasting impression on everyone you run into contact with. Learn the 7 steps to creating the best creative and professional business cards by reading our informative article. Follow a few simple rules when it comes to choosing the best fonts to include in your next batch of professional business cards. You’ll want to bold the most important features of your business cards, such as your business name, and keep the rest to a classic minimal design. The fonts you choose can be unique to your business design scheme, but make sure they are legible, too. Picking fonts with difficult to read script loops can be tricky. Leave those fonts off the table and stick to ones that are captivating and easy on the eye. Some popular font choices include Bebas Neue or Georgia. Forget about boring unoriginal Arial and go above the expected when you find the right font type to explain your business. When designing your business card, think about who you want to have access to viewing your social accounts. If you have a strong presence on Instagram, for example, you ought to include your handle on your business card. However, do not include your personal accounts where you do not post business photos. Adding your various social platforms on your professional business cards needs to stay as in tune with promoting your business accounts as possible. Leave out any potential confusion by excluding your personal Facebook account information on there, too. Another tip is to show off the accounts that do well for you. If you use Pinterest for sharing your work as a fashion blogger, it’s a great idea to include this information on the back of your card to enhance your social credibility. What better way to spread the knowledge of your awesome business than with a pretty piece of well-designed card stock? The days of cards with simple black and white text are long gone. Business cards need to be as modern as the business you own and operate, so get creative with what you print 500 copies of! Invest in the quality of the design you develop for your business cards. Working with a graphic designer is another way to stay in line with the color scheme of your business look and feel. Together you can establish a special logo that sums up the products or services you are trying to sell people. For example, if you own a hair salon, add some hairbrush or comb graphics in a shiny metallic color that beautifully glistens in the sunlight. Think about the popularity of rose gold metal business cards that include a metallic ink material all the millennials are loving at the moment. Now that’s some brilliant creativity to bring to the forefront of your business card design. Visually impressive cards are not cheap. You want your business to succeed, right? It takes investing in materials to marketing your company to do just that. If you want to leave an impression on the next person you run into chatting about your business, make sure they receive a high-quality card full of your information. Nothing says you don’t take the time out to invest in important marketing tools like a crumpled up card. Whatever design tactic you go through with, be confident in the quality of your business cards. It’ll look good on you as a thoughtful business owner once you begin handing out your professional business cards that took time and effort to produce. When you start adding more and more to a business card, things get overwhelming. You need to draw attention to just a few main takeaways from your card: your name, address, contact phone number, and e-mail. Everything else is extra. If you can use both sides of the business card then do so. You are able to be creative with your design on many different websites that allow you to customize what information is placed on the front or back. Include your company name on the front of the card in bold lettering and attach the rest of your contact information to be seen on the back. Be straightforward with the design elements. Don’t hesitate to cut back on the amount of color you use to tone things down and bring attention to the things that matter the most, which are your company name and basic contact info. Sometimes less is more. When running out of creative juices, you can usually find inspiration online. Do some research and look at your competition. What types of fonts and colors are they using for their business cards? Draw on these examples to create your own version of popular design ideas. Be sure to take away the big ideas and not copy their designs. Places such as Canva offer template designs that you can customize yourself. They have various business card templates you can easily search through until you find the best one for promoting your company. 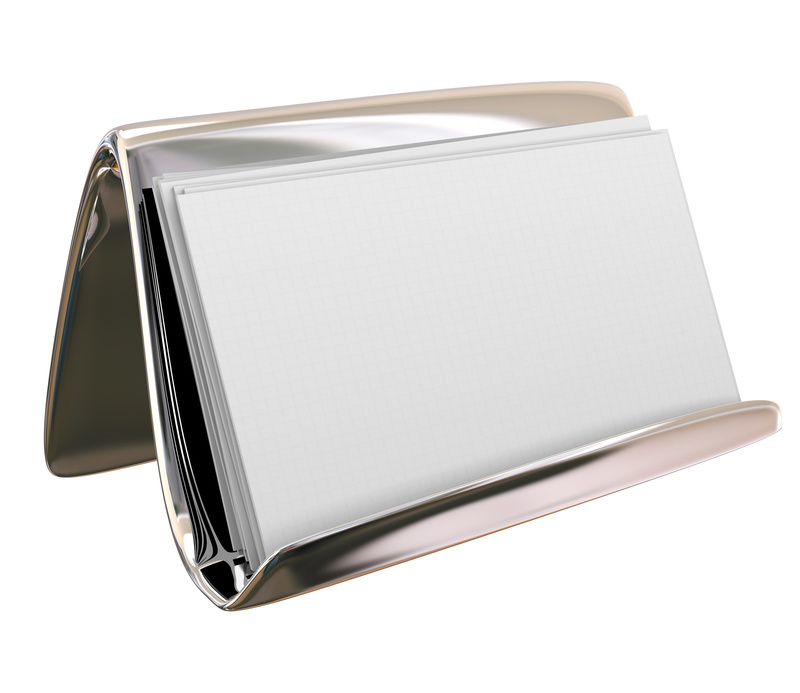 Protect your gorgeous new business cards by including a glossy finish on them. This high gloss coating definitely adds that extra bit of fun to your creative card design. You can choose glossy or matte based on the company you own. If you have a legal team that needs to keep things humble, then do so for the sake of your company image. If you own a beauty hair salon and have some freedom with your preferences, then having a glossy sheen can add some serious personality to your cards. Want More Business Articles To Learn How To Market Your Bussiness? We hope this article shows you the best steps to take to develop a fancy new stack of business cards to hand out to people you meet during networking meetings. Continue reading the business section of our website to learn more about running a successful business.